WEST HOLLYWOOD, Calif., Oct. 13, 2016 /PRNewswire/ -- Marijuana has been used as an agent for achieving euphoria since ancient times; it was described in a Chinese medical reference traditionally considered to date from 2737 B.C. As one of the most studied and tested substances of all time, marijuana was listed in the United States Pharmacopoeia from 1850 until 1942 and was prescribed by doctors to treat a variety of conditions. Under current California law, it is generally illegal to possess or use marijuana. On November 8 California voters will decide Prop 64, which legalizes the recreational use of marijuana in California. Exactly one week before the election on November 1, Lucky Lehrer, iconic punk/harcore drummer and Flipside Magazine's best punk rock drummer of all time, is pleased to be hosting a "A Celebration of the Music of Mary Jane" at the Whiskey A Go Go in West Hollywood from 8:00 pm till 12:30 am, and invites the general public to the event. Lehrer's foray into the politics of marijuana started in 1974 while working for a freshman congressman on Capitol Hill. Arguing against the aerial spraying of the defoliant Paraquat on the front page of the student newspaper at the University of California Lehrer observed "the nation's policy on cannabis appears inconsistent and ill advised." Performances will include jams by a growing list of luminaries that includes band members of Quiet Riot, Pink, Ozzy Osborne and plenty of others. There's going to be some surprise guest stars, Lehrer hints, because "you can't imagine the number of celebrities that feel passionately in favor of Prop 64." Lehrer is no stranger to the limelight as a founding member of the seminal punk rock group The Circle Jerks, and later with Bad Religion and The Darby Crash Band. "It's great coming back to the Whiskey, the kind of venue where most of us got our start, and feel the club's support at an important time," Lehrer states. So far as theme music, there's no lack of songs for Lehrer's list of musical celebrities to perform including Jimi Hendrix' The Wind Cries Mary, Along Comes Mary, by The Association, I'm in Love With Mary Jane by Rick James, Smoke Two Joints in the Morning by the Toyes (later covered by Sublime), Reefer Head Woman by Aerosmith and, of course Led Zeppelin's Goin' To California and Sweet Leaf by Black Sabbath. Who can forget One Toke Over The Line by Brewer & Shipley and Neil Young's famous Roll Another Number? Then there's The Joker by the Steve Miller Band ("some people call me a space cowboy….") and You Don't Know How It Feels by Tom Petty. There's loads of references to marijuana in hip hop, including Doctor Dre's The Next Episode and lots of other songs, some of which we'll perform on November 1 at the Whiskey, Lehrer smiles and says. 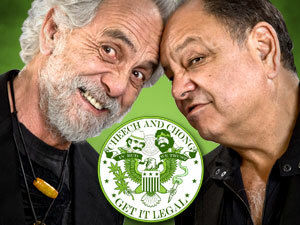 The free event also features comedian, actor and writer Cheech Marin (Cheech and Chong). There will be outstanding performances from a host of great performers. According to Lehrer, "you can't imagine the number of celebrities that feel passionately in favor of Prop 64" and there is never a better time to celebrate the music of Mary Jane than now. Tommy says Paris has become the wild west and it's Kim Kardashian's fault.